I don't really have a theme for tonight's concepts post. Mainly, I just thought these were different and interesting. Kind of curious to see what sort of feedback they get. One of my favorite things is seeing really nice concepts painted onto game action photos. So I'll start with those. There's this one Kings design from a while back that I liked a lot. I think it's kind of funny that Roberto Luongo is wearing it. I guess L.A. fans can dream, right? There was also a bit of Canadiens artwork that I made part of a Freak Out post that a lot of people responded rather well too. 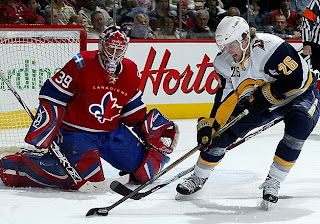 Here you can see what it looks like on Cristobal Huet. 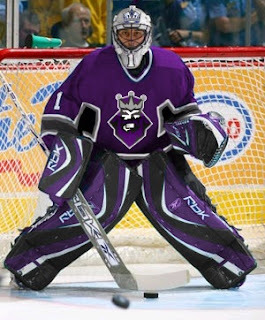 I wonder why both designers decided to paint fake jerseys onto goalies. Hmm. Anyway here are a few more wacky designs that don't quite warrant being included in the Freak Out series. For those who don't care for the sky blue, how about maroon? Doesn't look terrible either. I'm sure the asymmetry is still driving you nuts though. And how about the Ducks' logo and colors on a Sabres jersey? That's pretty weird. I thought the colors were interesting on the Bruins jersey. That logo really did wear out its welcome, though, didn't it? And for a complete change of pace, I've got a Flyers jersey with a redesigned set of logos. And to finish things off, as far as ironies go, I thought this was a pretty good one. 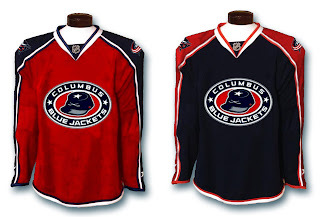 The Columbus Blue Jackets wearing red sweaters. Don't get me wrong. I think it's a really nice-looking jersey, but blue is in their name. It's one of those no-brainers. Anyway, let me know what you guys think of those. I'll try to have more posted tomorrow.